We have been blessed by a cartographer's decision in the 1890s that deemed the Caucasus Mountains the north / south dividing line between Europe and Asia. Mt. Elbrus, a lovely 18,586' glaciated twin summit, lies just three miles north of the Caucasus mountain divide and is therefore the highest mountain in Europe. Join the Berg Adventures International Mt. Elbrus 2007 Expedition team as we attempt to reach the summit of Mt. Elbrus.Over the next two weeks, we'll be bringing you continuous expedition coverage. Please join us. August 8, 2007  Mt. 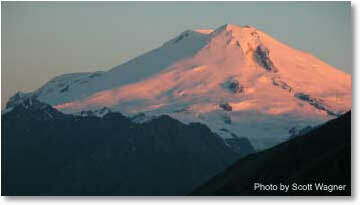 Elbrus 2007, Sweet Success!